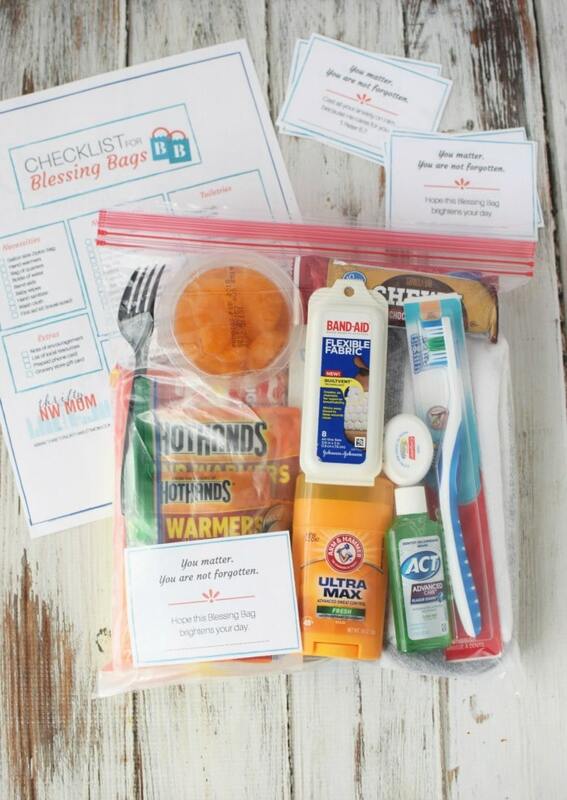 Blessing Bags - How to create + FREE Checklist! 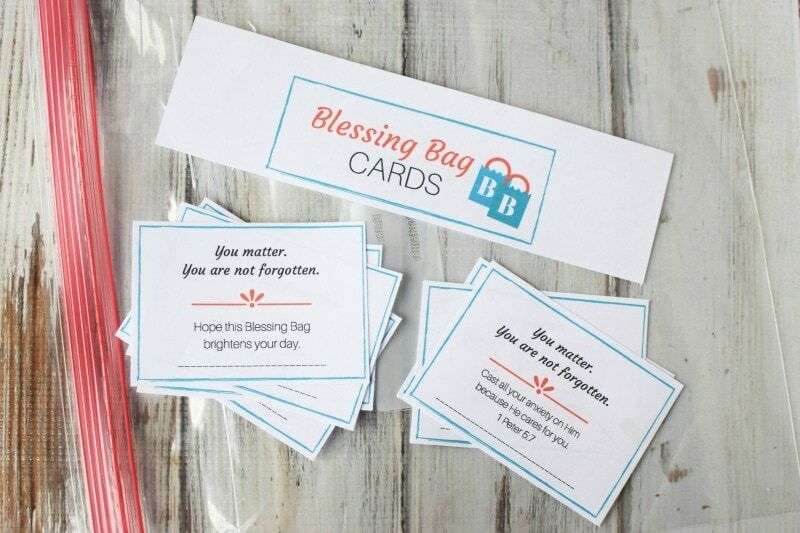 Pack a Blessing Bag to give to people in need – we’ve got a free printable checklist & free encouragement cards plus a list of all the items to include in your bag to give to people who are homeless, in shelters and more. In the past, we have shared a list of ways that you can give back to the community you live in & how to get kids involved and one of the ways we mentioned was to create Blessing Bag kits to hand out to those in need or to give to homeless shelters. 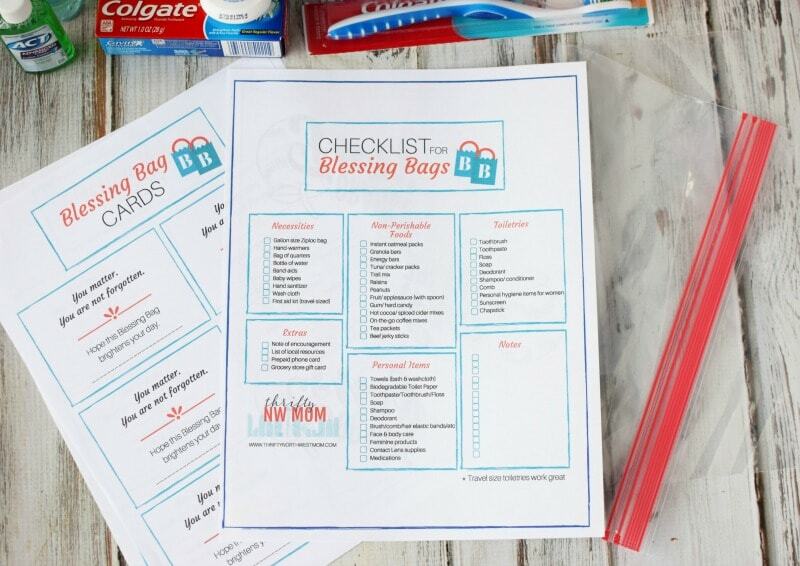 We have made it even easier for you to put together Blessing Bags using this FREE printable Blessing Bag checklist too. This is a very real, tangible way to help in a situation where you find someone who is in need and you really feel like you want to do something but are unsure of exactly what to do. 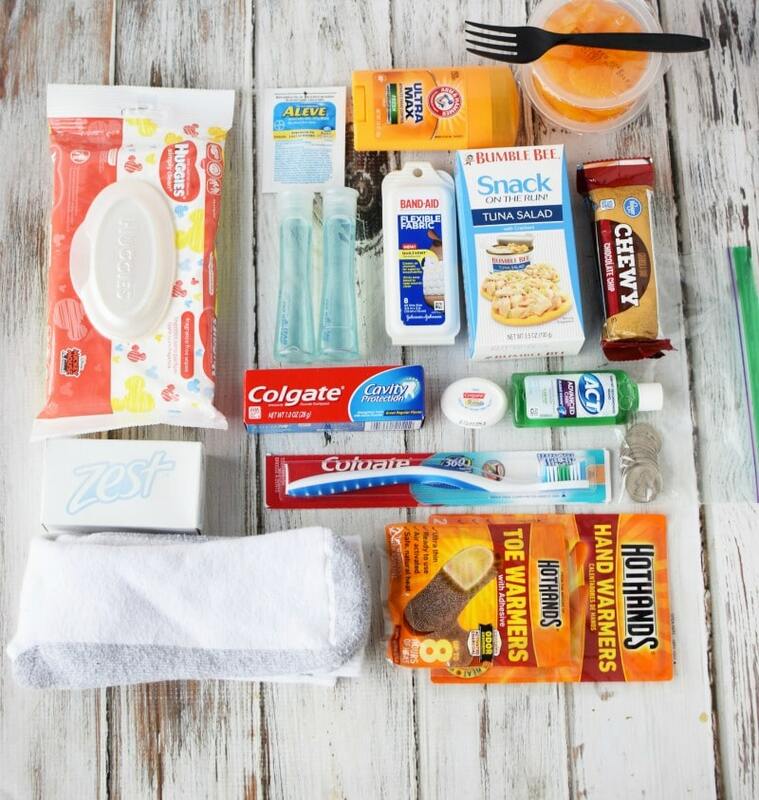 Handing out a Blessing Bag to someone gives you a very real way to meet their immediate needs by providing them with some basic supplies such as toiletries, water, food and warmth. 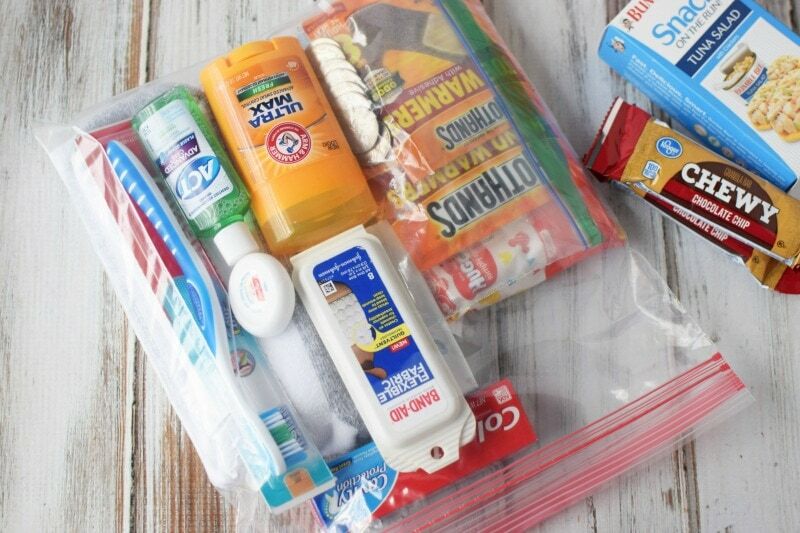 Blessing Bags are great to keep on hand in your car, so if you are in a situation where you find someone in need, you have the bag right there to hand to them. This is a way to demonstrate and teach your kids the act of giving in the face of a need instead of just driving by or walking away without responding. 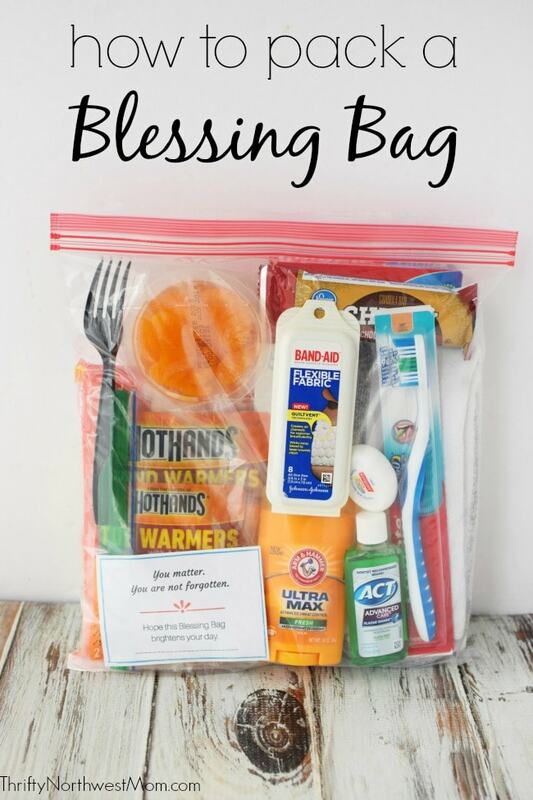 The Blessing Bag kits are also very helpful to donate to homeless shelters (see our list of Northwest homeless shelters, food banks & more) & other organizations working with the homeless. They can pass these out after they provide a meal so that the men & women can have some new supplies to add to their backpacks. They stack easily in boxes so you can store quite a few in an area to keep them stocked & ready to hand out to those who need them. Many of these items can be found at significant discounts when you use coupons & follow the sales as well as shop clearance sections, too. I keep a box in my closet to put these items in as I find them on clearance or with coupons & then when we’re ready to make the bags, we’ve already got quite a few items. Get your kids involved in picking out items for the Blessing Bags & then they can help you stuff the bags & get an assembly line style going at home. Teaching kids about helping people in need in real, tangible ways is an invaluable lesson! Watch this short video to see how easy it is to put together a Blessing Bag! **Get a FREE printable Blessing Bag checklist to print off & bring with you to the store with a list of all these items! Plus, a free printable note of encouragement that you can sign or customize with your own note. 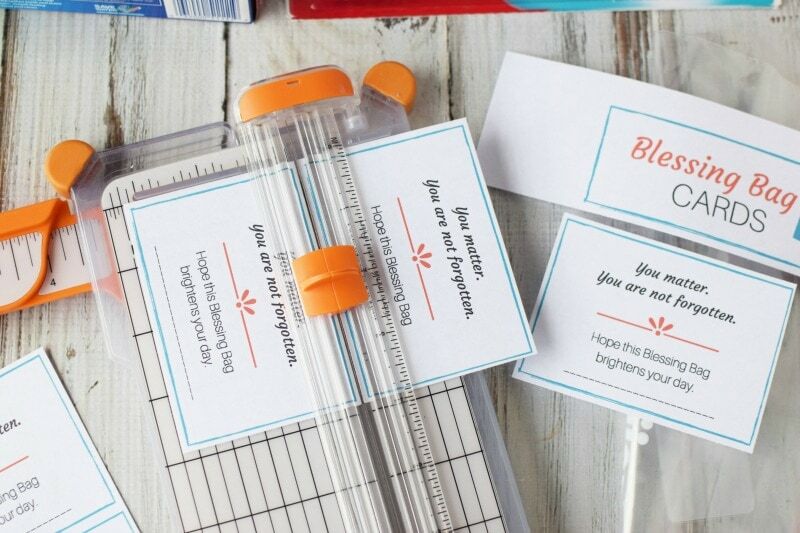 To make this easier when you head to the store to get your supplies, we have created a FREE printable checklist for Blessing Bags. This will help you to know what you need & organize better when you’re shopping at the store. Hope this Blessing Bag brightens your day. A fun idea is to have a bag stuffing activity at a party or group meeting if you’re looking for a community outreach project. Gather a group together & create a list of items needed for people to purchase ahead of time. Then everyone picks one or a few items to bring – by buying in bulk just one or two items, they can save more money than buying all the individual items. Set out a few tables & create an assembly line to assemble the bags quickly. These are a great way to add a service/community aspect to a get-together, especially around the holidays or if you’re looking for a project for a group or meeting as they’re very easy to organize & quick to put together. Participants can then either take a few bags to keep on hand in their vehicles or donate them all to a homeless shelter or organization. 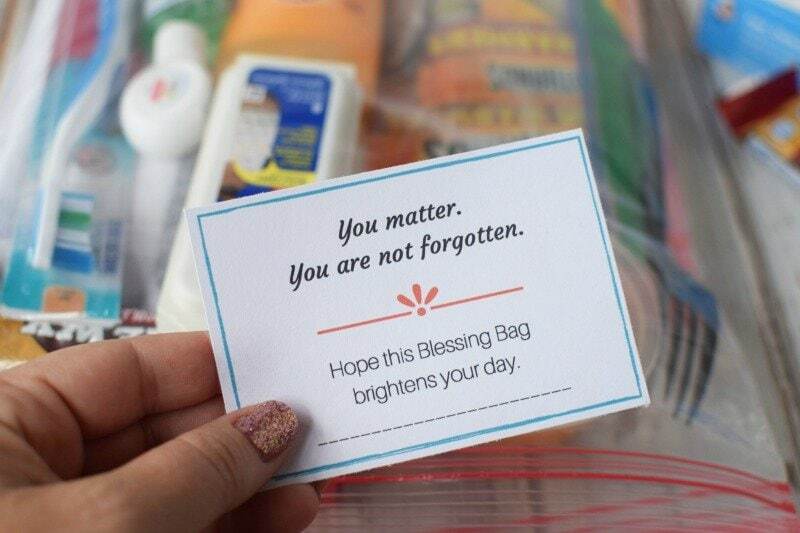 Have you ever created a Blessing Bag – any other items you’d include in these bags? Make sure to check out our Blessing Bag Meals as well as another option which would be great to pass out to those in need or leave on a doorstep of a family who may be struggling. That and I bought travel covers to go on the toothbrushes. No one likes a gunky toothbrush. If you’re making a bag for a lady, I know small makeup items are always appreciated (mascara, lip gloss, etc.) so I always toss one in there . What great tips, Emily! Thank you!! I have not seen these detergent sheets, but they sound perfect! And I had not thought of travel covers for toothbrushes, but you’re right, they do get gross fast if you don’t have them protected – definitely things to consider. And definitely think of some of the feminine needs if you’re making ones up for females! Those are awesome ideas, Erin! Thank you! I had to look up the wind-up torch though – didn’t realize it was a type of flashlight. :) I wonder if there are any cheaper alternatives for the camping fork/knife/spoon set if you’re doing multiple blessing bags – something to keep an eye on in camping clearance for sure! It would be nice for them to have something other than plastic! Great idea. I will be making these up. Thanks but the only thing that prints is a big bag. It does work really well as a service project for groups as you can assign different people to just bring one or two of the items & find a bunch of them. Like one person bring all the toothbrushes, one person bring toothpaste, etc. Thank you Allison for the kind words! WRT COSTCO (and all other on line price list.) Often the prices on line have zero to do with in store prices. In my experience most on line vendors up-charge by ~20% over in store prices. Try to get the in store prices is difficult at best unless you want to spend hours on hold on the phone.